Happy Birthday Annie.....and, A New Direction? Well, this post is a tad late, as Annie's birthday was March 26th. 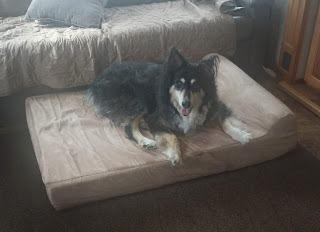 We celebrated her birthday by buying her an Orthopedic dog bed and making Instant Pot Brownies (for us, not her) and then I forgot to post it to my blog. Just my weird sense of humor!! I saw this online, somewhere, and decided to print one off for the office. It has received quite a few chuckles, hopefully the 'hint' will work. 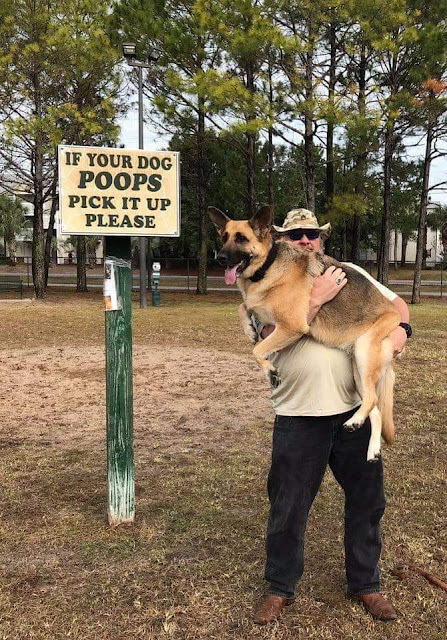 I don't know why, but some people don't like to follow rules in an RV park and like I told the boss, this is a humorous way to remind them that this is one of the rules in any RV park. Well, it's been 5 months since I updated this blog. Where on earth does the time go? In October, the park was dressed up for Halloween and I also made several trips to the Patch to get pumpkins, squash and just to visit!! In October, we drove to Central OR and met our older Son there and he helped us load our U haul with the stuff from our shed we had there. We went out for lunch and he headed back to the Eugene area and we headed back to WA to take our stuff to a storage shed near where we work. Well, here we are!!! We have been at our present location for a little over a month and a half. We both have been busy learning our new 'jobs'. 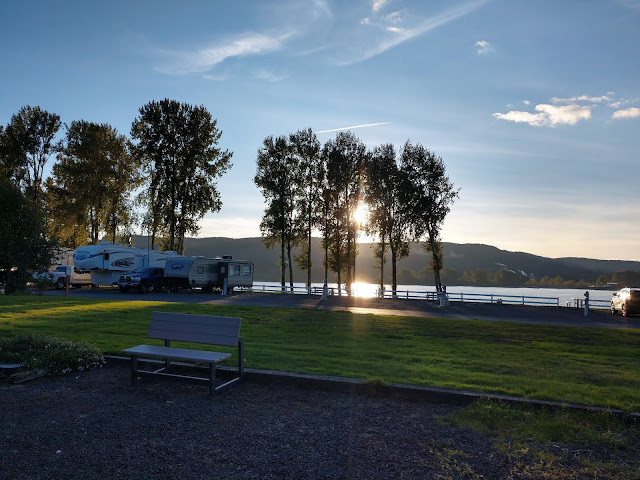 We are Workamping at an RV park on the Columbia River in Washington state. I am learning the reservation system in the office and David is doing maintenance work and helping keep the park beautiful!! I have to say, this is one of the nicest RV parks we have stayed at. It may not be a resort and have a lot of activities like some do, which doesn't bother me...but it is QUIET and the view is fantastic!!! We see ships going up and down the River every day and I still get excited when one goes by. And, yes, they are that close. That is one HUGE ship!!! One of my favorite spots to sit when I am not working, to watch the ships. Love to see the Riverboat go by several times a week. This was taken from the window at the back of our RV. Sitting next to the River enjoying the sunset. Well, here we are!!! 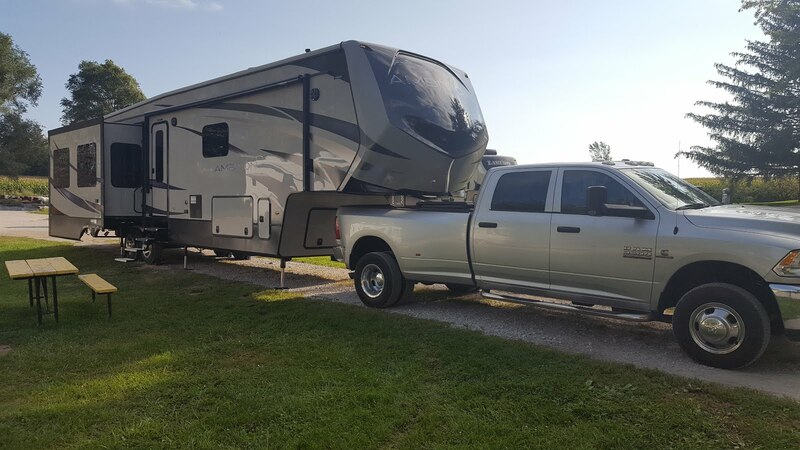 It's our last day here at Crescent Beach RV park. We'll be heading for another adventure, tomorrow. And, I will update the blog when we get settled in. I was pretty excited, though, as this past Saturday, we saw THREE cruise ships go by all in a row. That's the first time that has happened since we've been here. The photo does not do it justice, but it was a cool sight to see. Quite a few people lined up to watch them go by. 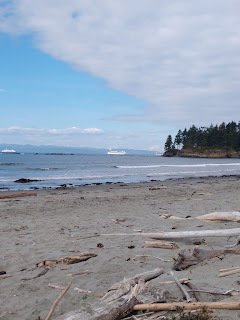 Well, here we are, our last week at Crescent Beach and RV park near Port Angeles. We decided to take a little drive, yesterday, and check out a few places that we hadn't yet visited and also share some photos from our past few months of working here. We decided to visit the little museum in Joyce, WA just up the road from us about 2 miles or so. 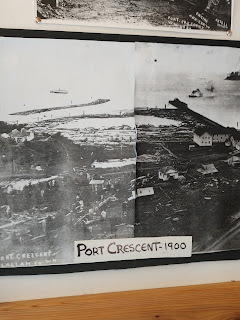 One of the things on display was the photo, above, of where the Crescent Beach and RV park now sits. It used to be a port and a logging site. Very interesting to read about. We also saw some really neat artifacts and this old truck, that our Granddaughter enjoyed sitting in. She got to come and stay with us for the last week or so of our stay here. We've had a lot of fun!!! AND, collecting shells!! I told her she didn't have to pick up EVERY one she saw.